From Riga to Saint Petersburg and back. A coat that traveled all the way from an Eastern European city of Riga to the cultural capital of Russia. The coat that returned back to 'little Paris' after spending some good time in one of Saint Petersburg's boutiques, to participate in an international competition for young designers, Habitus Baltija 2015. The coat which after such a journey ended up on my shoulders. This is how you can describe a little journey of a hand embroidered coat from Katerina Zhigulich's 'Frost in Spring' (Latvian 'Salna Pavasarī') collection. A very tender, elegant and feminine collection partially inspired by Latvian culture, country's influence is sensed in full in the coat with beautiful embroidery at the back side. 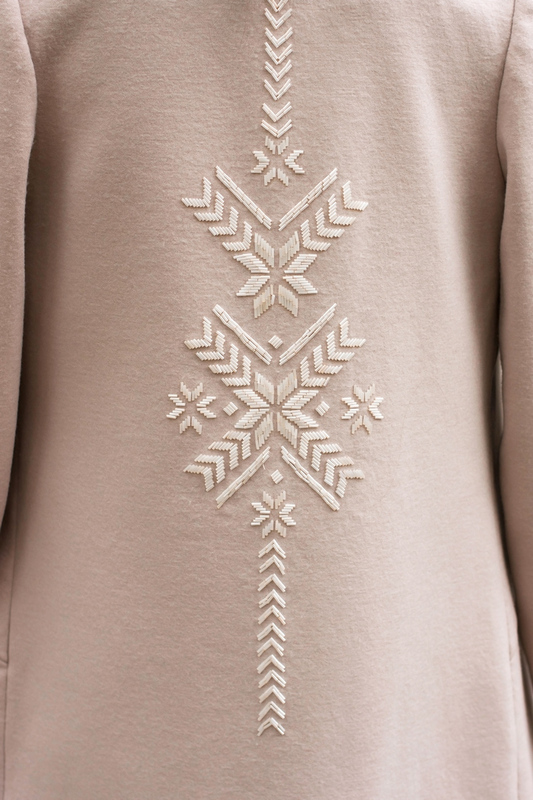 The designer paid a lot of attention to details and embroidery as such, moreover, it happened to become an essential element of the 'Frost in Spring' collection. Couple of dresses from this collection have already been featured on Practical Queen AP back in December 2014, when we teamed up with the emerging Latvian designer for a festive Katerina Zhigulich Christmas Story. The collection 'Frost in Spring' was showcased in full at Habitus Baltija 2015 in April, where Katerina Zhigulich participated by representing her university. Basically, the international competition was the reason the coat returned back home after quality time at a Saint Petersburg's boutique, Fashion Laboratory, where it was showcased as an example of modern Latvian designer's mastership. What citizens of the city upon river Neva, who happened to come across the coat, thought of it will probably remain a secret for us now... Meanwhile, you can plunge into my experience with Katerina Zhigulich that we had during Habitus Baltija 2015 by catching up on Habitus Baltija with Katerina Zhigulich and Katerina Zhigulich Habitus Baltija 2015 Video Diary stories. To say that I was not craving to wear this coat by Katerina Zhigulich would be a huge piece of lie from my side. I've wanted to touch it, feel it and try it on ever since I got to know the designer and her creations. A perfectly structured coat is a synergy of simplicity and craftsmanship. The coat will perfectly complement both an absolutely casual outfit and a more high class, elegant one. It doesn't scream, but rather makes a strong statement by its overall appearance, while the hand embroidery at the back side comes as a cheery over a delicious cake. Katerina Zhigulich's coat is without a doubt a piece of art that will be appreciated by a true connoisseur.